Place the Roast in a crock pot on low and pour all the ingredients on top. Cook Low and slow for 6-8 hours. After 6 hours shred the meat and let it sit in the pot for longer. (Preferably 2 hours but less is ok) Add salt and pepper to taste keeping in mind the condiment count. Preheat the oven to 350 deg. Take 1 large spaghetti squash and cut it in half the long way (it is hard to do and requires some muscles). Clean out the seeds (its easier to do it before you cook it than after, TRUST ME). Place it in a pan faced up in the oven cooking for 1 hour. After you remove it allow it to cool for 10-15 minutes and then using a fork pull out the squash. 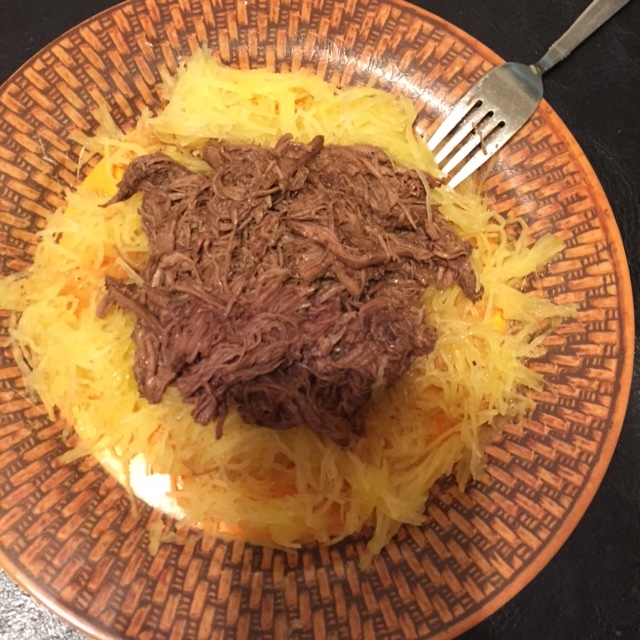 Place 1 1/2 cups of spaghetti squash in a plate or bowl. The meat should divide into 4 portions that are 5oz each, place 1 portion on top of each portion of squash. Divide the sauce in to 4, and pour on top. You can freeze it at this point, but its really delicious so it may not make it that far! NOTE: Some leaner cuts of meat don’t “shred” so well. A great trick I learned is after its all cooked, slice it up. Then take it with the liquid and place it in a pan and FREEZE it for 24 hours. Then allow it to defrost and reheat, something in that process allows the meat to “break down”.